USB operated hollywood style makeup mirror light, very useful for your makeup! USB operated hollywood style makeup mirror light, practical and ornamental. 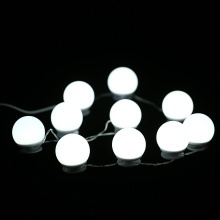 It consists of 10 LED bulbs, producing bright and natural glow for better makeup. 5.1m/16.7ft total length fits most of the mirrors. Designed with a touch dimmer switch, short touch to turn it on/off, long touch to adjust brightness steplessly. Comes with double-faced adhesive tapes, easy to install, no wiring or drilling required.